Putting on a coat of paint is an art inspired by science. Every hue breathes a fresh wave of emotion, bringing your walls to life and filling your home with vibrant energy. Nippon Paint leverages world-class technology and innovation to bring you a wide array of kaleidoscopic colour choices and superior features that include breakthrough odour-less technology, low VOC, anti-bacterial and anti-fungal properties, easy wash-ability, hiding, durability and more. NIPPON PAINT KIDZ ALL-IN-ONE PAINT: As the coatings expert, we have always wanted to champion indoor safety and wellness for all children. Our mission was to empower all parents to give their children clean air to breathe, safe indoor environments and the freedom to be creative through every stage of their development from infanthood, to toddlerhood to childhood. 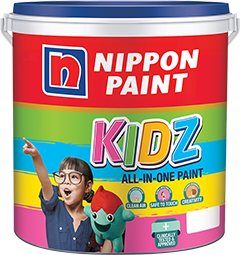 Through this belief, Nippon Paint kidz was born. 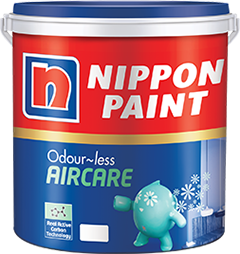 NIPPON PAINT ODOUR-LESS AIR-CARE is an air purifying paint that contains active carbon technology which converts formaldehyde into water vapor, bringing about the clean fresh air. It also has ultra-low VOC and no odour is anti-bacterial and possesses superior wash-ability. Additionally it does not contain lead and mercury, it is ideal for eco-sensitive buildings. 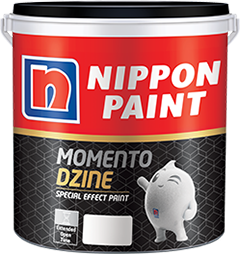 NIPPON PAINT MOMENTO is a range of special effect paint, an unorthodox approach to painting surfaces. Momento offers you a choice of textures to unleash creativity. This particular paint has a high drying time. Whether it is a frosted look or a luminous gold, silver or pearl sheen, Momento can make surfaces like interior walls, ceilings, cement-based plasters, gypsum based plasters, brick works, hard and soft boards and fiber cement boards a conversation starter. 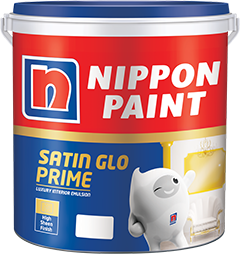 NIPPON PAINT SATIN GLO PRIME luxury interior emulsion is a pure acrylic emulsion formulated to impart high sheen to decorate interior walls. It possesses excellent washability and stain resistance to keep the walls beautiful for long. It’s a low VOC product which ensures safe and healthy interiors. Its anti-bacterial property provides proven protection against bacteria. 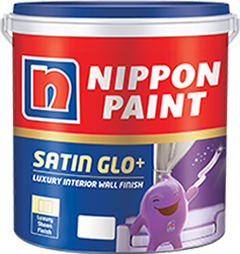 NIPPON PAINT SATIN GLO+ is a luxury interior emulsion specially formulated to bestow a rich glossy satin-like sheen to decorate interior walls. It possesses excellent wash-ability and stain resistance to keep the walls beautiful for a longer time. Its anti-bacterial property provides proven protection against bacteria and also contains ultra-low VOC, ensuring safe and healthy interiors. 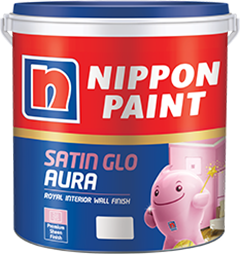 NIPPON PAINT SATIN-GLO AURA is an interior emulsion with special polymer technology to bestow a delicate sheen to decorate interior walls. It possesses excellent washability and stain resistance to keep the walls beautiful for long. It’s low VOC ensuring safe and healthy interiors. NIPPON PAINT SPOT-LESS NXT is a specially-formulated acrylic emulsion paint that repulses household stains such as tea, coffee, juices, ink, hand-prints, and so forth. Our unique ‘Swan-back’ technology makes it highly resistant to the penetration of water-borne stains and causes them to form beads. This ‘beading effect’ guarantees stains don’t stick and can be removed easily without damaging the paint. 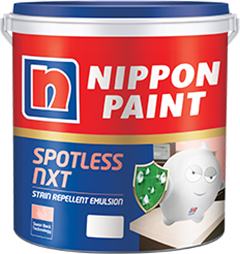 Nippon Paint Spot-less NXT is a high-quality paint that is suitable for bedrooms, hallways, living and dining rooms. 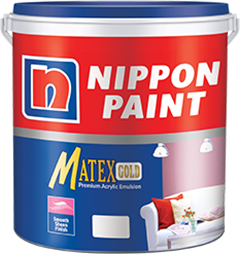 NIPPON PAINT MATEX GOLD is a premium acrylic emulsion which provides a smooth sheen finish to interior walls. It delivers excellent coverage, possesses good washability and has low VOC, hence maintaining a healthy home. 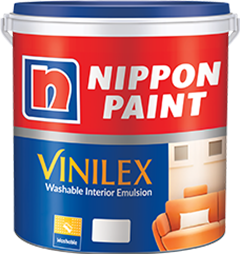 NIPPON PAINT VINILEX is a premium water-based modified acrylic emulsion paint for interior walls. It is durable, washable and provides a superior smooth finish. It offers good hiding and spreading qualities. 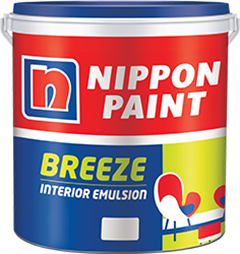 NIPPON PAINT BREEZE is an economy interior emulsion that provides a smooth finish. It contains low VOC and is odorless. It delivers an exceptional by covering any strain or spot on wall surface. 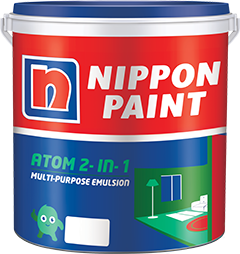 NIPPON PAINT ATOM 2-IN-1 multi-purpose Emulsion is flat and durable paint which makes it ideal for both interior and exterior surfaces. Following extensive R&D and by listening to our decorating partners inputs, this dynamic paint has been developed for maximum performance which is based on acrylic modified emulsion.